1. Filling: Place garlic and 2/3 cup peas in a food processor and pulse 5 to 6 times. Add walnuts and continue to pulse until a coarse grain consistency has formed. With the motor running drizzle the oil into the mixture in a slow and steady stream until completely combined. Fold in Parmesan and season with salt and pepper. In a small mixing bowl, combine the mascarpone, egg yolk and lemon zest until completely mixed together. Fold the pea pesto into the mascarpone mixture until fully combined. Season with salt and pepper. Cover and refrigerate until ready to use. 2. Ravioli dough: In a mixing bowl combine flours and salt and whisk together. On a clean work surface or in a bowl place flour mixture in a mound. Make a well in the center of flour and crack eggs and 1/4 cup water into the well. 3. Using a fork gently whisk eggs and water together while slowly incorporating flour. Once flour and eggs are combined, add more flour little by little to form a ball that is no longer sticky to touch. 4. If dough is dry add more water, 1 teaspoon at a time. Knead dough for 8-10 minutes (dough should feel very tight and should bounce back when gently pressed), wrap in plastic and let sit for about 20 minutes before using. 5. Sprinkle flour onto a clean surface and roll pasta dough until 1/8 inch thick. Cut pasta into a 12”x24” rectangle and cut rectangle down into 6, 12”x4” strips. Lightly dust a large baking sheet with semolina flour and line strips of pasta side by side. Lightly cover wit plastic wrap. 6. To assemble: Lightly dust a clean surface with semolina flour. Place a pasta sheet onto the clean surface and brush with egg wash. Fill a piping bag with the filling and pipe 1 teaspoon sized dot of filling onto the pasta sheet, about 1” from the bottom of the pasta sheet and about 1 inch apart. Gently fold the pasta sheet over the filling until there’s about an inch of the pasta on the bottom still exposed, and gently press around each filling dot to remove any air bubbles. Using a pasta cutter/pizza cutter/knife, cut off the top 1 1/4” of the pasta sheet. 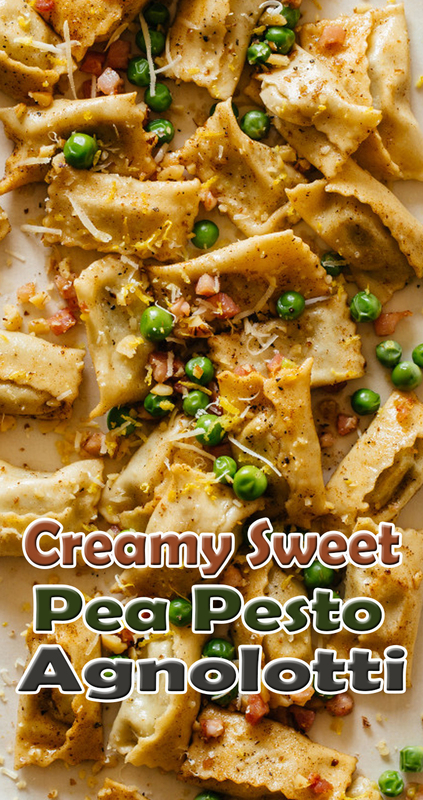 Carefully stand the row of pasta covered filling upright (90˚) and firmly cut between each standing dot, beginning with the sealed end, to create a stuffed pasta with a small kangaroo-like pouch on one side of each agnolotti. 7. Repeat until all the pasta sheets and filling have been used. Place all agnolotti onto a baking sheet dusted with semolina flour and loosely cover with plastic wrap. Refrigerate for at least an hour and up to 1 day (agnolotti can be frozen for up to 3 months). 8. Fill a large pot with water and bring to a boil. Add a handful of salt and agnolotti and boil for 4 to 5 minutes or until agnolotti begin to rise to the top. 9. While water comes to a boil, place a large skillet over medium-high heat and sauté pancetta for 2 to 3 minutes. Drain pancetta with a slotted spoon and set aside. 10. Add butter to skillet and melt over medium heat. Once butter has melted, bubbled and turned light brown, with a nutty aroma, add shallot and garlic and sauté for 2 to 3 minutes. 11. Transfer agnolotti from the boiling water to the skillet, using a slotted spoon and sauté for 2 minutes. Add pancetta, peas, lemon zest and juice, and half of the Parmesan to the skillet and toss together. Generously season with salt and pepper. 12. Finish dish with remaining Parmesan and serve.